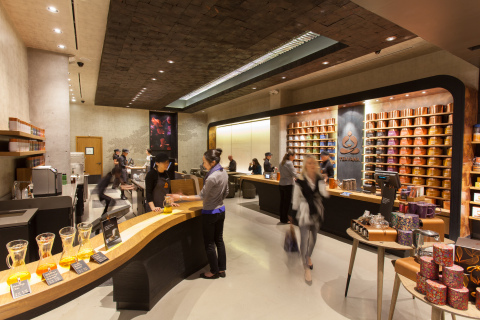 Teavana debuts new tea bar, but will it work? Are you a Teavana fan? I’m on the fence with them, especially after Starbucks acquired them about a year ago. I think I had expected them to become more a tea-cafe experience rather than just a store. They’ve been doing a decent job of it given that they’ve seem to be expanding at a quick pace, but the experience of purchasing a cup of tea and enjoying it on premise has been greatly lacking. Don’t get me wrong, the people that work there typically know they’re stuff and are helpful. But the shops are rarely designed to accommodate a crowd ordering tea and waiting for it to steep. And sometimes there’s no milk! You’re then ushered out the door by waiting patrons to sip your tea as you stroll the mall. But it sounds like they too were thinking the experience could be improved. So, Teavana today previewed it’s first Teavana Fine Teas + Tea Bar in New York City’s stylish Upper East Side. Opening tomorrow (24 Oct 2013), you’ll have the Teavana “Wall of Tea” featuring a wide range of loose leaf teas and tea blends, and the store will have a collection of curated tea merchandise. Additionally, customers will be able to choose from a range of food items, all inspired by and designed to complement tea flavors, including pastries and breakfast items, salads, flatbreads and small plates, and macaroons (is this macaroons or macarons? Someone tell me what they sell? ), shortbreads and other desserts . They say the bar will make the ritual of tea more elevated and accessible for customers. Hopefully this means that I won’t leave more agitated than I went in on a busy shopping day. The new tea bar experience will expand to additional stores over the course of the next year. (I hope San Jose is near the top of the list.) I guess us plebeians outside of the Upper East Side will just have to wait to see if this tea bar is as good as it sounds. Teavana Fine Teas + Teavana Tea Bar is located at 1142 Madison Avenue (cross street: 85th Street).To learn more about store hours and offerings, visit www.teavana.com. I was informed today that they have a Chocolate Chai Tea Latte for autumn. (Dessert in a cup!) Also, announced today, we’ll begin to see a curated loose leaf tea selection for customers in Starbucks stores. Sounds like this is along the lines of what we see in Peet’s Coffee. And earlier this month Starbucks also changed its rewards program so you can also use your points to buy beverages and loose-leaf teas at Teavana.